Study shows that structure of toxic tau aggregates determines type of dementia, and rate of progression. Recent efforts to develop a treatment for Alzheimer’s disease and other dementias have focused heavily on removing toxic tau proteins from the brain. The tau protein is known to bind microtubules, structures enable transport of cellular components, in neurons. 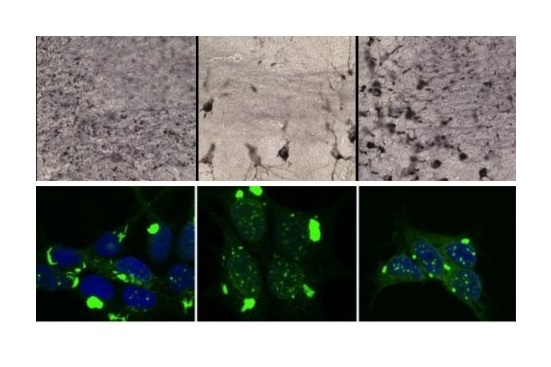 However, the protein becomes toxic in patients with Alzheimer’s and other dementias, forming aggregates that progressively accumulate and lead to loss of neuron function and eventually to neurodegeneration. Now, a study from researchers at UT Southwestern Medical Center shows that the distinct structures of toxic tau protein aggregates that form in degenerating brains determine which type of dementia will occur, which regions of brain will be affected, and how quickly the disease will spread. The team state that their study has implications for earlier and more accurate diagnoses of various dementias through definition of the unique forms of tau associated with each. The study is published in the journal Neuron. Earlier studies from the lab show that tau acts like a prion, an infectious protein which can self-replicate and spread like a virus throughout the brain. They determined that tau protein in human brain can form many distinct strains, or self-replicating structures, and developed methods to reproduce them in the laboratory. This research led the group to investigate whether these strains might account for different forms of dementia. The current study shows the three-dimensional structure of a tau aggregate will determine which neurons are vulnerable to it, how readily it will create more pathology, and how quickly it will spread throughout the brain. The current study utilises special cell systems to replicate distinct tau aggregate conformations. These different forms of pathological tau was inoculated into the brains of mice. Each form created different pathological patterns, recapitulating the variation that occurs in diseases such as Alzheimer’s, frontotemporal dementias, and traumatic encephalopathy. Results show that the different forms of tau cause pathology that spread at different rates through the brain, and affected specific brain regions. Data findings show that the structure of pathological tau aggregates alone is sufficient to account for most if not all the variation seen in human neurodegenerative diseases that are linked to this protein. The team state their data findings answer the fundamental question of why some brain regions are vulnerable in certain cases whilst others are not, and why some diseases progress more rapidly than others. They go on to add that in addition to providing a framework to understand why patients develop different types of neurodegeneration, their work has promise for the development of drugs to treat specific neurodegenerative diseases, and for how to accurately diagnose them. They conclude that these findings indicate that a one-size-fits-all strategy for therapy may not work, and that the global medical community should approach drug development with an awareness of which forms of tau they are targeting. The team surmise their study implies that with knowledge of tau aggregate structure in patients, or possibly even in healthy individuals, it should be possible to predict the brain regions most vulnerable to degeneration and the rate of disease progression. For the future, the researchers state that they now plan to investigate how to rapidly determine the forms of tau that are present in individual patients, whilst developing specific therapies. A new study demonstrates that toxic tau aggregates can be used to determine which type of dementia will occur, which regions of brain will be affected, and how quickly the disease will spread. Top: These tau strains were inoculated into the brains of mice and formed unique patterns of pathology that can be linked to specific dementias. Bottom: Dr. Marc Diamond’s lab replicated distinctly patterned tau strains, shown in green, in cultured cells.